From 20 to 25 August 2017 NATO Communications & Information Agency, Europol European Cyber Crime Centre (EC3), The Netherlands Ministry of Defence Cyber Command, Leiden University, Dutch Innovation Factory organised the International Cybersecurity Summerschool 2017 together with The Hague Security Delta. 55 participants representing 19 nationalities attended this six-day long event. The group consisted of students, PhD candidates and young professionals with backgrounds in tech, law and policy and a special interest in the topic of cybersecurity. 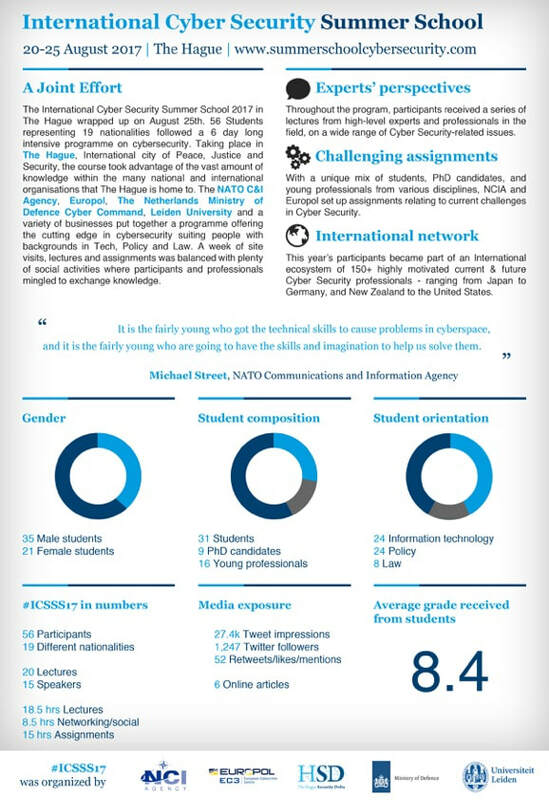 Throughout the programme participants received lectures from high-level experts and professionals in the field on a wide range of cybersecurity related issues.